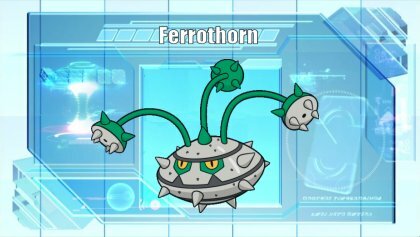 Ferrothorn, The Thorn Pod Pokémon. By swinging around its three spiky feelers and shooting spikes, it can obliterate an opponent. They attach themselves to cave ceilings, firing steel spikes at targets passing beneath them. It fights by swinging around its three spiky feelers. A hit from these steel spikes can reduce a boulder to rubble. Blessed with one of the best defensive typings in the game, Ferrothorn has not really changed a lot since its introduction in Gen 5. Thanks to Ferrothorn's great bulk, for many years, it has been the premier hazard setter in most Singles teams, which is what it does best. Thanks to its great utility movepool, high defenses and typing, it finds itself as an easy pick for many teams that require a check for dangerous sweepers such as Ash Greninja, Tapu Koko, Gyarados, and Tapu Lele on a single Pokemon. However, while Ferrothorn is extremely slow, due to its prevalence in Singles, Pokemon such as Magearna and Mega Latios usually run coverage moves such as Hidden Power Fire and Focus Blast in order to deal with Ferrothorn which limits its ability to check these Pokemon reliably. 74 / 131 / 116 Defenses are fantastic defensive BST for a wall. While its HP is kinda low, it is balanced by its high defense stats. 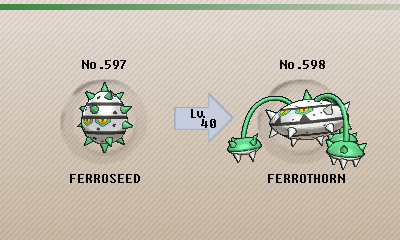 Steel / Grass is a very solid defensive typing as it gives Ferrothorn 9 resistances and an immunity to Poison while only having two weaknesses. This makes Ferrothorn a very efficient and common answer to offensive Water types such as Ash-Greninja and Mega Swampert. Ferrothorn possess a great utility movepool with options such as Leech Seed, Knock Off, Thunder Wave and Bulldoze, as well as being one of the best hazard setters in the game providing both Stealth Rock and Spikes. While Ferrothorn's base 94 Attack is average, it hits decently hard enough with the high base power of STABs such as Power Whip and Gyro Ball. Iron Barbs is a great ability as it allows Ferrothorn to chip down some damage on Pokemon that rely on contact moves when they attack it. A x2 weakness to Fight and a x4 weakness to Fire means that Ferrothorn will be easily forced out by these moves from the likes of Heatran, Hawlucha and Mega Lopunny. Due to how common Ferrothorn is, special attackers such as Magearna, Tapu Lele, Mega Alakazam and Greninja tend to run coverage moves such as Focus Blast and Hidden Power Fire to damage Ferrothorn badly, preventing it from checking these threats. While base 20 Speed is great for a Gyro Ball user, it makes Ferrothorn extremely slow, making it move last most of the time. Defoggers such as Zapdos, Mew and Tornadus-Therian are easily able to remove Ferrothorn's hazards while hurting it badly with their coverage moves or cripple it severely with a burn or Taunt. Magic Bounce users like Mega Sableye can also bounce its hazards to its own team, which Ferrothorn can't do anything against. In another generation of Pokemon, Ferrothorn fulfills its role as one of the best hazard setters in Singles. Thanks to its great bulk and defensive typing, Ferrothorn is able to reliably set up Stealth Rock or Spikes due to the amount of switches it can easily force while helping its teammates to whittle down the opposition. If you are already using a Stealth Rock user, Spikes should be considered on the first slot as it allows Ferrothorn to stack hazards on the opposition and damage grounded Pokemon like Mega Mawile, Tapu Fini and Chansey, making it easier to break them down. Otherwise, feel free to use Ferrothorn as your sole Stealth Rock user in case you can't fit the move on another team member. Leech Seed grants Ferrothorn recover by sapping the opponent's health while healing itself. It makes Ferrothorn an incredibly annoying Pokemon to switch into as not many Grass types (who are immune to Leech Seed) can really threaten it unless they carry Fire coverage. Power Whip is Ferrothorn's main STAB and with its base 120 base power, it can easily OHKO or 2HKO most Water, Ground and Rock types that are hit super-effectively by the move. However, Bullet Seed is preferred in Battle Spot due to Mimikyu's prevalence. On the last slot, it depends on what your team needs: Gyro Ball is a secondary STAB that hits fast Pokemon such as Latios, Tapu Koko and Weavile very hard thanks to Ferrothorn's low Speed. Knock Off is an always good option to remove the foe's item and cripple common switch-ins such as Zapdos. Protect makes Ferrothorn an stalling machine and lets it abuse Leech Seed recovery at the cost of being more passive. Finally, Thunder Wave can heavily cripple switch-ins such as Heatran or Mega Charizard X/Y. Max HP and +164 SpD EVs prevent Choice Specs Ash Greninja from ever achieving a 2HKO on Ferrothorn even after Stealth Rock and one round of Spikes damage, while 92 Def EVs prevent Ferrothorn from being 2HKO'd by Choice Band Zygarde's Thousand Arrows. However, Ferrothorn is pretty customizable and you can play around with the EVs depending on what you want to achieve with this Pokemon: 252 HP / 48 Def / 208 SpD prevents Ferrothorn from being 3HKOed by pre-transformation Greninja's Choice Spec boosted Dark Pulse from full HP. Alternatively, you can use a physically stronger defensive spread of: 252 HP / 88 Def / 168 SpD with an Impish / Relaxed nature in order to deal with Swords Dance Excadrill and Landorus-T.
Iron Barbs is the only ability Ferrothorn should ever consider using for competitive formats as Anticipation is virtually useless. Leftovers should always be the optimal item for Ferrothorn to use as it grants it a great recovery to combine with Leech Seed. Chople Berry is an option to let Ferrothorn stomach Mega Medicham's Hi Jump Kick and cripple it with Thunder Wave. Rocky Helmet is also a niche pick to abuse Ferrothorn's Iron Barb and chip up to 30% on every contact move. In case Power Whip's accuracy or Bullet Seed's power lets you down, Seed Bomb is a more accurate Grass STAB Ferrothorn can use in order to avoid accuracy issues. However, the power drop is very noticeable specially against threats such as Keldeo or Manaphy. Bulldoze deserves a mention not only for taking a good chunk of damage on Pokemon like Mega Charizard X and Heatran, but also, by reducing their Speed, it makes them easier to deal with for your team. Toxic is a valid option in order to cripple Pokemon like Zapdos. Apart from it, it has no other use as most of Ferrothorn switch-ins are Steel types immune to poison, while Ferrothorn prefers Thunder Wave's utility and being able to cripple Volcarona, Heatran or Mega Charizard X. While it may seem unconventional, Choice Band Ferrothorn can fill a very effective role on select teams, abusing the switches it forces in a very different way. This is easier to recommend in Battle Spot though, where its unexpected power has more value. Ferrothorn's place in Doubles, much like in Singles, has not seen much change over the years. While its ability to set hazards is not highly valued in most Doubles formats, Ferrothorn still finds itself very annoying to deal with if unprepared. In a format where Protect is such a valuable move, Leech Seed alone makes a Pokemon as bulky as Ferrothorn a legitimate threat. Often times a team will be forced to bring their Ferrothorn checks solely due to how difficult it can be to deal with it otherwise, and this is true even in a GS Cup format such as the current 2019 format. With Xerneas and Kyogre being such common threats, Ferrothorn finds itself on many teams at the moment, whether to aid them or defeat them. However, Incineroar being as common as it is certainly does not help Ferrothorn in any format, as it more or less ensures a team will have a Ferrothorn answer, reducing some of its team preview pressure. That being said, Ferrothorn has a whole team to support it, so if you're willing to help Ferrothorn do its job, you will not be disappointed. 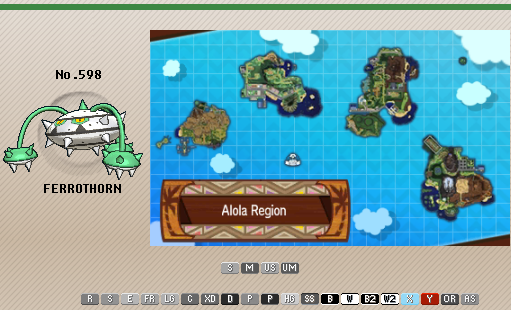 Ferrothorn is very straightforward in how it plays, with most of its variation being in the EV spread. Gyro Ball is the primary Steel-type STAB which is mostly valuable for dealing with Xerneas, though its coverage is lacking against most other foes. Power Whip is Ferrothorn's best Grass-type STAB which proves valuable for dealing with Kyogre, and despite its accuracy it's fairly reliable. Leech Seed provides very valuable utility that helps increase its longevity against all the legendaries with big HP stats, and also provides some momentum with switches. Protect is a given and it synergizes well with Leech Seed, allowing it to stall a turn for some recovery which can possibly be against two foes. A Brave nature with full investment in HP and Attack is listed to maximize offensive presence which is important against Xerneas, but shifting focus into Special Defense with a Sassy nature is an equally valid approach. The choice depends greatly on how much you want to rely on Ferrothorn's defensive traits and how much of an immediate presence you want from it. Leftovers is the preferred item because Ferrothorn is durable enough to gain a lot of valuable recovery from it, especially in conjunction with Leech Seed. However, a pinch berry can provide more immediate recovery which can be valuable for more offensive spreads like the one listed above. Iron Barbs is the only ability worth using despite many threats being special attackers, if only to put an extra dent in Incineroar after going down to Flare Blitz. - Ferrothorn doesn't have many other options worth consideration in Doubles, if only because it has no room due to Protect being mandatory. Knock Off can provide some nice utility against the many berries in the format, though making room for this is hard to justify. 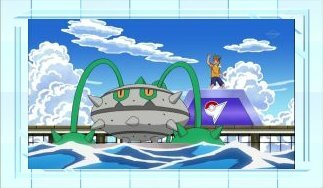 - Kyogre is a particularly good partner for Ferrothorn since the rain it provides weakens the more common of its two weaknesses. Kyogre itself is also effective at threatening Incineroar, which is the most common user of Fire-type moves. - Yveltal appreciates Ferrothorn's ability to check Fairy-types while also providing more direct offensive support against Dusk Mane Necrozma and Lunala. However, Incineroar can still be an annoyance to both so teammate that can handle that is still necessary. Volcarona, Charizard and Heatran deserve a special mention as they can outright OHKO Ferrothorn while setting up in front of it quite easily. They only have to fear for the occasional Thunder Wave. Strong Fighting STAB users like Mega Medicham, Mega Lopunny and Mega Lucario can also threaten Ferrothorn out quite easily. Anything with Fire or Fighting coverage will heavily dent Ferrothorn. Pokemon like Tapu Lele, Mega Alakazam, Greninja and Magearna tend to commonly run coverage moves like Hidden Power Fire and Focus Blast which takes a huge blow on Ferrothorn's ability to check them properly. Strong nukes such as Kyurem B's Sub-Zero Slammer or Magerna’s / Hoopa Unbound's All Out Pummeling can easily push a OHKO on Ferrothorn. Ferrothorn has made a few appearances in the anime. Most notably, Ash's rival Cameron used it in his Unova League campaign.